Well Pumps and Borehole Pumps are specially designed high-pressure water pumps. They have a greater than average head (pumping height) and are generally narrower so they fit easily in to tight spaces such as wells and shafts. Springs and wells have been used for thousands of years and their location has often been the reason for towns and villages ‘springing’ up. Any place with the name Bourne in its name is related to springs from the old English word burna, meaning spring. Examples include Bourneville, Eastbourne, Sittingbourne. 33% of water supplies in England and Wales are from groundwater sources, with nearly 2.5 billion m3 being abstracted yearly. A deep round hole, bored into the ground using a special tool, usually to search for water (or oil). Borehole or Well Pumps are types of submersible pumps which are often used for spraying, irrigation, and pumping stored water from water butts. The range of high pressure pumps can be used in agriculture and industrial settings. These water pumps are usually used to extract water or liquids from a borehole. The holes are drilled with special drills to create set diameter holes. The borehole pumps come in different dimensions to suit these holes. Borehole pumps are available in numerous sizes and models, so you can always find one that suits the flow rate and head (pumping height) that you require. They are available in manual and automatic versions. Automatic versions save energy as they are only activated when needed and then turn off until needed again. The pumps are usually made from a corrosion resistant material as they are in contact with many different minerals in the soil as well as water. A standard submersible pump may rust or corrode and need replacing much sooner. Borehole pumps are made up of two main parts; a foot section that holds the pumping system, which sits in the water that needs to be pumped, and a head section, which is where the water is pumped out from. Water is always pumped out from the head because boreholes are extremely narrow with little or no spare space around the pump for any external hose or tubes. There are not many other pumps that would be able to fit in to these confined spaces making the borehole pump a specialist item. The MVH Well Pump is the only pump in this range where the hose connection is on the side of the pump. The MVH is therefore designed for wells and not narrow boreholes. 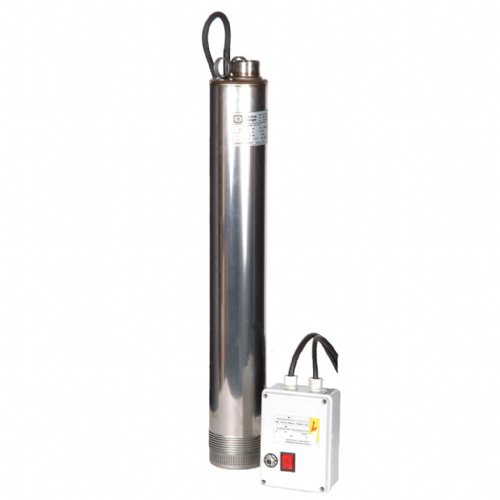 It is a hybrid between a borehole pump and a submersible water pump, offering both a good head height and flow rate. As borehole pumps are long and narrow, they can hold several impellers (the rotating part) one on top of another. This is what increases the head height of the pump. The general rule is that a pump can either have a high flow or a high head. The stacked impellers create a very high-pressure difference, forcing the water out under high pressure. 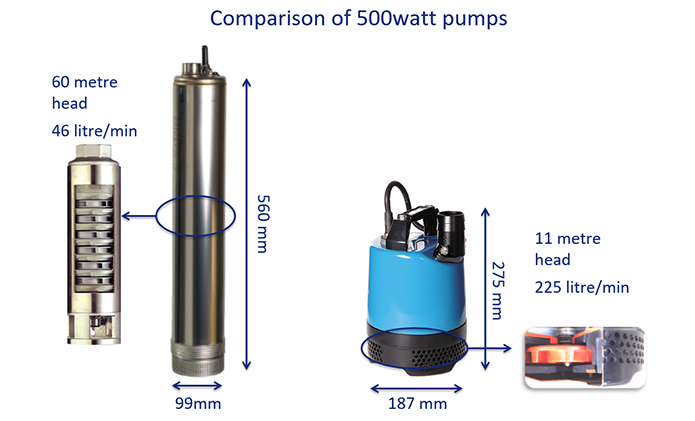 On a regular submersible pump, the pump is wider and only has one impeller. The wider impeller creates a higher flow rate but less pressure. The diagram shows the stacked impellers in the borehole pumps which create the high pressure. The well pumps offer a compromise between flow and pressure. 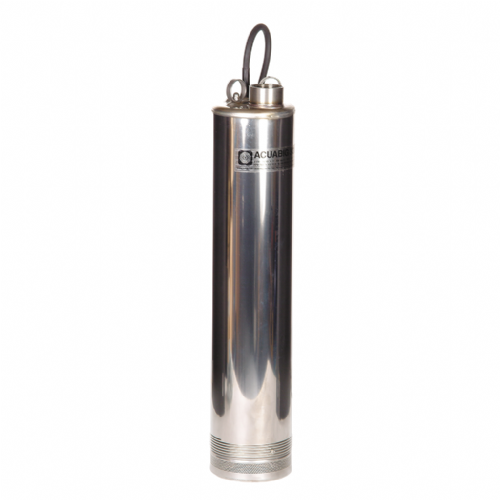 They are generally wider than borehole pumps and therefore can have a higher flow rate. As the position of the pump could be several metres deep one of the most crucial factors to consider is the ‘head’ output. The pumps in this category are designed to have a higher head output than normal submersible pumps. You will generally find that the taller the pumps, the higher the head output is (as they have more stacked impellers – covered earlier). Borehole Pumps are available in many sizes as they are designed to fit snugly in to the hole, whereas Well Pumps are wider and therefore have a higher flow rate output. Both types of pump are available in 110v and 230V making them suitable for for domestic or onsite use. The Divertron is particularly useful as the pump has an integrated programme which recognises when a valve or tap is opened or closed, automatically turning the pump off or on. This pump can be connected to a hose and will turn on and off when the hose trigger is activated. It is therefore also perfect for use as irrigation pump, for example, if you wanted to water your garden using the water from a well, the pump can remain submersed in the well (and left plugged in). When the hose jet trigger is pulled, the pump will turn on without having to ever touch the pump. It is perfect for washing cars and watering gardens without the need of an outside tap. The Acuascub range is very popular thanks to the high-head range on offer, up to 100m head height! This makes the pump perfect for pumping water long distances or from deep in the ground where there may be a well or aquifer (underground water) you are looking to pump water from. We offer a wide range of pumps for wells and boreholes. We’re sure you’ll find what you’re looking for. We have handpicked the best water pumps available. If you require further information, please call our help desk on 0115 987 0358 or Contact Us.